Apple announced a family of three iPhones powered by a 7-nm SoC enabling up to 512 GBytes of memory. The handsets range in price from $749 to $1,099, increase battery life by 30 to 90 minutes, and ship within two to six weeks. The smartphones, and two new models of the Apple Watch, generally packed larger screens and upgraded chips in slightly smaller devices. None of the devices support 5G cellular networks, expected to start switching on later this year, but the handsets support Gbit/s data rates, an LTE capability that Qualcomm was early to support. Apple’s 7-nm A12 Bionic chip packs 6.9 billion transistors and is “the most powerful chip in a smartphone,” said chief executive Tim Cook. The A12’s two high-performance CPU cores deliver 15% more speed and 40% greater efficiency than the prior A11. Four other cores are 50% more efficient than those on the prior chip. The 10-nm A11 was touted as sporting up to 25% more performance and 70% more efficiency than its predecessor, reinforcing reports that the 7-nm node delivers declining advantages. The A12 packs a six-core GPU designed by Apple, said to be 50% faster than the block on the A11. An upgraded neural engine sports eight cores, up from two in the A11. Apple claims that it delivers a nine-fold performance gain on its CoreML machine-learning framework, hitting 5 trillion operations/s, up from 600 billion ops/s on the A11 using one-tenth of the energy. The performance will speed a variety of operations, including unlocking the phone using Apple’s facial-recognition software. It also enables a new capability to group multiple Siri functions into shortcuts. Third-party developers showed applications using Apple’s CoreML and ARKit 2 frameworks to enable new features supported by neural nets. They included Homecourt, an app tracking six metrics of basketball performance in real time, as well as new features in mobile games using augmented reality. The new handsets use 6.5- and 5.8-inch OLED displays supporting 458 pixels/inch and a 6.1-inch LCD on a low-end model supporting 326 pixels/inch. The iPhone XS and XS Max include dual 12-Mpixel-wide and telephoto cameras while the low-end XR uses a single 12-Mpixel camera. All of the cameras support a variety of features, including HDR10 and adjustable depth-of-field, relying on an image processor and the neural engine in the A12. “This is a new era of computational photography,” said Phil Schiller, Apple’s vice president of marketing. Apple wound up the performance of its smartwatch with an S4 system-in-package using two 64-bit CPU cores to deliver twice the performance of its existing devices. 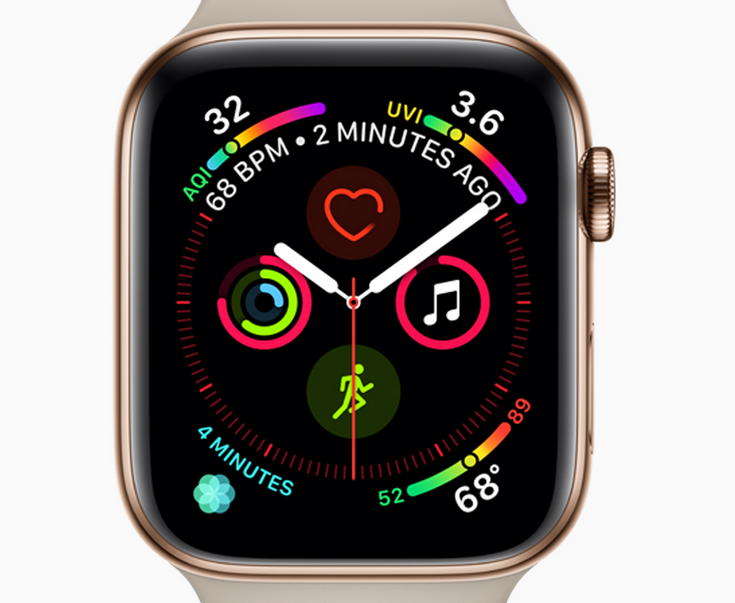 The Apple Watch Series 4 maintains the current 18-hour battery life, or six hours when using GPS tracking. The news comes two days after Qualcomm announced an updated smartwatch chipset, significantly extending battery life and supporting four Cortex-A7 cores. A new accelerometer/gyroscope samples motion eight times faster with twice the dynamic range. That enables the device to detect a fall and make an emergency call if it detects no motion for a minute after the event. The Series 4 uses 40- and 44-mm curved displays, about a third larger than Apple’s existing devices. The curved displays fit up to eight pieces of information on a single display, letting users configure a wide variety of custom screens. The smartwatches will be available later this month for $499 for versions supporting LTE and $399 for ones using GPS. Apple will discount older Series 3 watches to $279. Both Watch OS 5 and iOS 12 will be available on Sept. 17. “Apple was founded to make the computer more personal, and we’ve taken this mission further than anyone could imagine,” said Cook, noting that the company will ship its three-billionth iOS device soon. Our website places cookies on your device to improve your experience and to improve our site. Read more about the cookies we use and how to disable them here. Cookies and tracking technologies may be used for marketing purposes.By clicking “Accept”, you are consenting to placement of cookies on your device and to our use of tracking technologies. Click “Read More” below for more information and instructions on how to disable cookies and tracking technologies. While acceptance of cookies and tracking technologies is voluntary, disabling them may result in the website not working properly, and certain advertisements may be less relevant to you.